King of the United Kingdom and Hanover. Dubbed "Farmer George" and also known as "the Mad King" and the King who lost America. 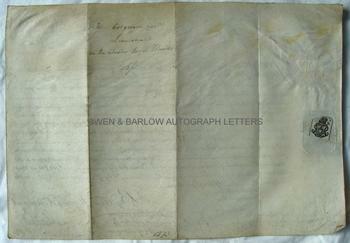 Fine AUTOGRAPH signature at head of the Commission of John Cotgreave as a Lieutenant in the Chester Loyal Volunteers. 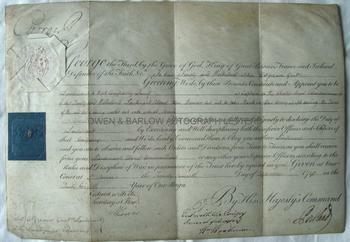 Countersigned by the Prime Minister, William Cavendish Bentinck, 3rd Earl of Portland. Dated 27th September 1796. On vellum parchment. Approx 13.5 x 9.5 inches. With the Royal impressed paper seal affixed and a revenue seal for 12 shilling and sixpence. Folded, as issued. A little browning/foxing to edges, else fine. The Loyal Volunteer regiments were militias which were raised all over the country, from about 1793 onwards, in response to the threat of invasion by the French at the start of the Napoleonic Wars. The Chester Loyal Volunteers was a militia raised by Lt. Colonel John Bonner. Lt. Congreave's commission must have been one of the first to be made, as the name of the Captain of the Militia has been left blank, presumably as the appointment had not yet been made.